Washing a car may impact the environment in ways that car owners may have never realized. Studies suggest that the particles and chemicals released during car washing contaminates city storm drains that store rainwater. In addition, this contaminated water ends up in natural bodies of water, such as rivers, streams, and lakes. This has prompted many cities and jurisdictions to enforce regulations on car washing. Concerned governments and organizations aim to reduce or eliminate these toxic chemicals altogether. Fortunately, car owners can find Eco-friendly solutions to help clean their vehicles. This may include exclusive green cleaning products, waterless systems, and car washing kits that help reduce the negative impact on the environment. The first step to cleaning your car without harming the environment is rinsing the exterior with some water. Use a hose and sprayer to remove dirt along the bottom of the vehicle and tires. Use water conservatively by only focusing on dirtier areas on the vehicle. 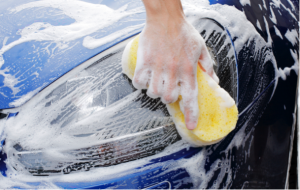 Next, use a sponge to clean your car with a homemade car wash soap made of liquid dish detergent and warm water. For a heavier grime, use 12 tablespoons of laundry detergent. Use microfiber cloths to wipe the exterior. Old t-shirts and towels also work to dry off the vehicle without scratching it. Some manufacturers offer environmentally friendly waterless systems that do not produce water runoff from the vehicle. This will save water and keep the car looking new. In addition, some jurisdictions offer car wash kits that help conserve water and keep the contaminants from running into the storm drains. All of these suggestions will help clean your car without harming the environment. There are many Eco-friendly ways to clean your car's upholstery and carpets as well. For instance, you can sprinkle baking soda on all of the surface areas about 15 minutes before vacuuming, to freshen the interior. Add a few drops of essential oils to the baking soda to create a pleasing odor. Clean the dashboard and other hard surfaces with a homemade solution consisting of two parts olive oil and one part lemon juice. Pour this mixture into a spray bottle and spray the target areas. Use a clean rag to wipe and shine these surfaces. Use vinegar to clean the windows and then wipe them down with a clean rag. Lastly, create a homemade air freshener spray consisting of one tablespoon of rubbing alcohol and 25 drops of any essential oil. Fill the bottle with warm water and shake well. Spray the inside of your car to freshen the air. These cost-effective solutions will clean your car and have it smelling fresh without wearing down on your conscience. Have fun being clean and green!